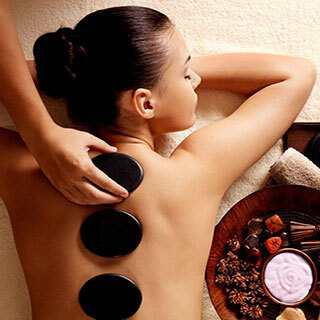 Commonly known as the Swedish Massage, our Signature Massage uses traditional techniques such as applying circular pressure and firm kneading to relax the entire body and wash away tension. In addition, you will benefit from increased oxygen levels in the blood, improved circulation, a decrease in stress hormone levels, and greater flexibility. All Signature Massages come with a complimentary foot scrub! Therapeutic massages help individuals overcome pain and stress by utilizing pressure points. This massage triggers points on the body that need special attention. Works well for all individuals looking to relieve extreme tension. Make a massage appointment with your significant other. Our specialized massaged therapists will ease away stress and tension, creating a relaxing environment for the couple. Need appointment in advance. Give your feet a little extra care with our reflexology focused foot massage. Reflexology uses pressure points on the feet to stimulate the body’s nerves, leading to less tension and a healthy body. Eliminate stress and boost your energy with aromatherapy. This massage balances your body’s limbic system, the system controlling emotions, through with essential oils. Relax, rejuvenate, and revitalize your body with aromatherapy. Prenatal massage allows you to enjoy the benefit of massage, with extra care. Your body goes through many changes during pregnancy, sometime it can be painful and stressful. The benefits of prenatal massage help to decrease lower back and leg pain. It’s also helps to improve sleep, lower stress and relax muscles. Prenatal massage requires a different technique for safety of mother and child. *The Beauty Clinic requires you to be past your first trimester. ** All Services and packages are Not- Refundable, This includes Laser, Massage, Photo Facial, Tattoo Removal, and Skin Tightening Treatments.